Stone Mountain is a quartz monzonite dome monadnock in Stone Mountain, Georgia. At its summit, the elevation is 1,686 feet amsl and 825 feet (251.5 m) above the surrounding area. Stone Mountain granite extends underground 9 miles (14 km) at its longest point into Gwinnett County. 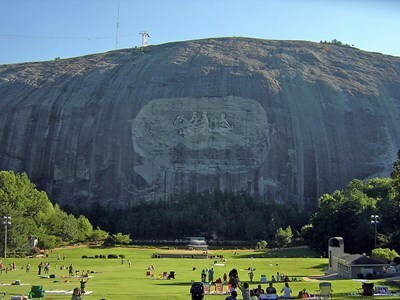 Numerous reference books and Georgia literature have dubbed Stone Mountain as “the largest exposed piece of granite in the world". This description uses material from the Wikipedia article on Stone Mountain and is licensed under the Creative Commons Attribution-ShareAlike License (view authors).